Standardisation, modularity, flexibility have been the buzzwords in the transformation of industrial production over the past two-three decades. Carmakers, Airbus & Boeing, even shipbuilders implemented it. In the end train builders, notorious for unique custom designs, too. The process started long ago with diesel locomotives. Next were the electric and diesel multiple unit families created towards the end of the nineties. With the roll-out of French maker Alstom's PRIMA II prototype on 3 June, the process now concluded for electric locomotives, too. What follows is the first half of a journey into industrial history – with subplots about technological advances, merger mania and neoliberal excesses, political and intra-company intrigues, and European unification. In Europe, most of both passenger and freight transport is carried on electrified mainlines. So it's electric locos that are subject to the highest requirements on performance (and operating reliability). And that's why they must be in the focus of the EU drive to enable cross-border operations, too. For electric locomotives, in addition to separate commissioning, differing signalling equipment, differing loading gauges ( = cross section), and even gauges ( = distance of rails); there is also the issue of differing supply voltage systems. These divide Europe in a hodgepodge pattern. So, there were plenty of reasons why electric locos for different countries and uses were unique designs – and they made quite a lot of variables to consider when one wanted to standardise those designs. However, the way there was rather non-straightforward. For one, it started with different goals. In the seventies, some national railways were thinking: what if the industry could make locomotives that are equally fit for express and stopping passenger trains, and freight? Then, one could realise economies of size in production, less idle time in operation, and less trouble with rare parts in maintenance. wound field electric motors drive the wheels through gears. Under DC overhead lines, the first two elements could of course be spared. Wound field electric motors come in DC and (somewhat less efficient) universal versions; so in many AC locos, the rectifier could be spared, and switching was done on the transformer. In diesel-electrics, the input is from a generator (driven by the diesel engine). While wound field electric engines are efficient in a much wider power-speed range than say diesel engines, and thus don't need to change gears, they still have ideal regimes. So gear ratios were set according to the target top speed, and sizes scaled according to the target power and type of use. Meanwhile, switch groups and the motors (with their friction contacts) were subject to significant wear. Asynchronous AC electric motors are lighter, yet stronger than wound field ones, and do without friction contacts. Thus, for practical purposes, they have no ideal power-speed regime: they are near 100% efficient from 0 to 230 km/h, from 0 to 1700 kW. The engines can be accelerated continuously (no switching between steps) and individually by regulating the output of the inverters. This allows a full use of adhesion, without slips of individual wheelsets. This – in theory – means the need for less axles (four in place of six for heavy freight and 200 km/h express). Both inverters and rectifiers use the other innovation: new high-power semiconductors. These are not only smaller and lighter, but enable efficient conversion between DC and AC in both directions. That is, you can brake actively by using the motors as generators, then the inverter as rectifier and the rectifier as inverter, and thus feed electricity back into the overhead line. 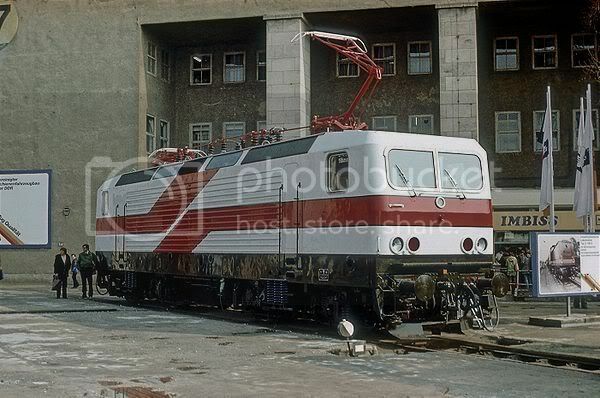 From 1971, [West] German Federal Railways DB and makers Henschel (mechanical part) and BBC (electrical part) experimented with inverter-fed asynchronous AC motors in a batch of three test locomotives: the diesel-electric DE2500 (DB class 202). After the oil crisis hit, in 1974, 202 002 was combined with a driving trailer into one of the strangest animals on rail. What can be best described as a cripple with prosthetics was the ancestor of all modern electrics. With its diesel engine and generator removed, 202 002 got electricity from the overhead line via a pantograph and transformer installed on the driving trailer. 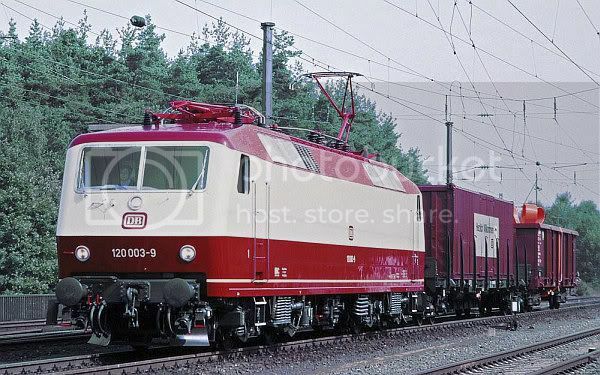 For further tests in the Netherlands, 202 002 was later again rebuilt into a proper electric loco (NS 1600 P). Finally in 1979, the first application in a high-power mainline electric came: the five prototypes of DB's class 120, the intended proof of concept of a universal loco. A third, less important technological innovation changed appearance most: turbo fans, with small air intakes on the sloped roof edges, resulted in flat sides. Both the prototypes and the series units (from 1987) proved to be a heavy learning exercise. The new technology and higher power caused a lot of unexpected problems (like fatigue breaks from new types of stresses) that had to be sorted out. However, just when they finally got the technology working, the German rail industry was caught out cold: the expected giant order for a proper universal locomotive (the still more powerful projected class 121) just never came. For, in the meantime, a spectre started haunting Europe: the spectre of neo-liberalism. Politics wanted privatisation – and, as a first step, the separation of long-distance passenger, local passenger, and freight operations. Also dividing up locomotives. Good-bye, universal locomotive. In the simplest configuration, an electric locomotive's gear creates a rigid connection between motor and wheelset (with cogwheels). Thus the motor's mass rests at least partially on the wheelset, adding to the unsprung mass – the mass interacting with the rail directly. However, a locomotive's stress impact on the rails (and, in reaction, the strain on the cogwheels) is roughly proportional to both speed and unsprung mass. Meaning, if you don't want to replace track behind (and cogwheels inside) higher speed locos every few years, you somehow have to reduce the unsprung mass. The way to go was to "remove" the motor from the unsprung mass, by making the motor-wheelset connection elastic. The various solutions all involve a hollow shaft around the wheelset's axle (with the elastic element between that and the axle or the wheel face). 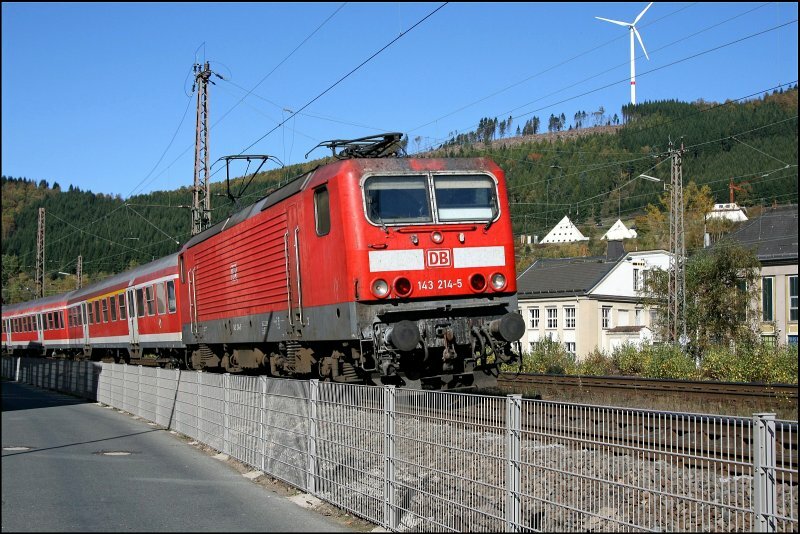 Now, when the new principle of separated operations arrived, DB's managers thought: the locos of our freight branch won't ever go faster than 140 km/h, so can't we save money if we order ones with simple old axle-hung motors? Other EU railways followed DB's example. And that's how manufacturers were forced to create dumbed-down versions of the universal locos they just created. Thereby moving towards modularity of production. First of all, railways ditched the service efficiency in using universal locos – an elimination of synergies. Even if the new freight locos are not much worse for the track at 120 km/h than express locos at 200 km/h, the overall mainline track wear is now worse than it would be with universal locos – what's more, worse than before, when even many of the newer freight locos had older hollow-shaft drives. But, for freight operators, track wear is an externality. The locos are cheaper and simpler to maintain. However, wheels and gears suffer higher wear, thus 'age' faster. Not to mention a potential counter-measure against problem 2: higher track access charges. A case of short-termism. It's not only the supply of asynchronous AC motors you can use high-power semi-conductors for. You can also use them to replace the switch group with continuous regulation in a conventional locomotive. To be specific: thyristors. In the early years, it wasn't immediately clear that asynchronous AC technology will grow out its teething problems, rather than remain impractical due to excess complexity. Thus, in the seventies and eighties, a number of successful thyristor-regulated locomotives were built. One family worth to mention (because the current market leader modular family emerged in the same factory) was that of East German maker LEW. After a prototype (1982), they first built 654(!) 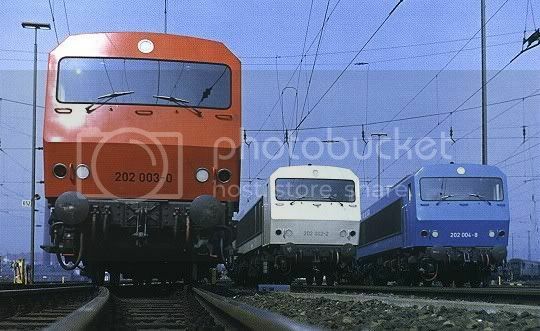 locos of a slower version (DR class 243, later DB class 143), then 39 in an express version (DR class 212.0, later DB class 112.0, today class 114). After German Reunification, but before the merger of Deutsche Bundesbahn and Deutsche Reichsbahn into Deutsche Bahn, a remarkable joint order for 90 more in the express version finished the family (class 112.1). Meanwhile, the class 143 became the 'Reunification locomotive': its members were migrated to all regions of former West Germany, too. The later DR class 243 were equipped for multiple operation, turning them into de-facto universal locomotives on East Germany's slow tracks. After Reunification, they were used for passenger trains. In the second part, I will continue to trace the winding route to today's modular locomotives – separately for each of the three main makers. I am presenting the development of modular locomotives in this (and the next) diary as a mixed blessing; swiping at stupid decisions in the new open-access, separated operations world. However, for the record, the integrated national railways' original idea, the universal locomotive, was not without a problem, either. The issue comes down to basic physics, namely that force is not the same as power (which has the physical dimension of force x speed). In a locomotive, crudely, you need to scale power for top speed, and force for maximum train load (well, as a function of the maximum grade travelled). The force a loco can exert ("tractive effort") is in turn entirely determined by two factors: the weight on the rails and the friction coefficient. Thus, you can make your four-axle loco as powerful as you want, the maximum weight of a train it can move will remain the same. And, more importantly, you can make its slip control as perfect as you want, your loco can pull less when the rails are lubricated by rain. On the map,isn't the UK electrical coverage a bit excessive? My decision on when to draw an entire area in some colour and when only smaller areas or single lines was necessarily a bit arbitrary. However, contrary to the stereotype, the bits in yellow and light blue for the UK do compare to many other regions of Europe (well, not Switzerland). WCML and ECML are completely electrified, so are the London to East of England lines; (most of) the Midland Mainline and transversal lines aren't. See map. I was much looser with Russia, where my thick coloured strips usually represent a single electrified mainline, but with only branchlines on the rest of the area. This is fascinating, dodo. I come from a long line of shade tree engineers for whom the abiding question of How Things Work, especially big, heavy, powerful things, is almost a family religion. I am intrigued by the force/load limitation. I have wondered more than once about the traction afforded by the relatively tiny footprint of a polished steel wheel on a polished steel rail. Is the force/load limitation primarily a matter of overcoming inertia to get the load moving in the first place, or is it a more continual problem of overcoming friction and wind resistance to keep the load moving down the track? Does traction take a big hit from rain-slick track, or is it a marginal degradation? Ha! First time I see this expression. What is/does a shade tree engineer? Is the force/load limitation primarily a matter of overcoming inertia to get the load moving in the first place, or is it a more continual problem of overcoming friction and wind resistance to keep the load moving down the track? On high grades, most of the tractive effort (the locomotive's/motor car's/EMU's/DMU's pulling force) is needed to hold part of the train's weight [weight times the grade], at any speed - that is, inertia has primacy. As for train resistance on flat terrain: until say 160 km/h (depends on the train), rolling resistance (e.g. wheel-on-rail and bearing friction) dominates. For higher speeds, it's wind resistance. Now, all the above are part of static train resistance. If you subtract them two from the maximum tractive effort at a given speed (the one allowed by adhesion and the train's maximum power), you get the force that can be used to accelerate the train. (You get acceleration by dividing that force with train mass.) This dynamic train resistance can matter, too (e.g. for rapid transit trains). Does traction take a big hit from rain-slick track, or is it a marginal degradation? A rather big hit, to the tune of 40%. Thanks for the explanation. You answered much more than I asked. Shade tree engineer is a play on the term shade tree mechanic, an amateur mechanic who works on his own vehicles in the shade of a tree in the yard. That's a common term in Oklahoma, and I imagine elsewhere. The men in my family tend to take it a bit farther than that. Most of them imagine they could do a better job than the professional engineers who design things. My dad routinely modified his farm implements to make them work better. His brother parlayed a degree in agricultural education and a knack for pragmatic solutions to mechanical problems into a rise from day laborer at a power plant to plant superintendent. but regarding slipping in the wet (or with leaves on the line), can't they go back using steam-age sand ? They do use sand, but that's not a cure-all, it won't restore the static friction coefficient to that on dry rail. Regarding leaves, that's less of a problem for the heavy locomotives, but worth to note what helps best against the problem: brake blocks. That is: in older trains, braking was done by pressing brake blocks on the wheel's running surface itself -- with the added benefit that any slippery film attached to it from the rails was removed. That was no longer the case in modern EMUs and DMUs with their disc brakes. However, in Italy, the rail authority just prescribed the installation of brake blocks alongside disc brakes in EMUs and DMUs -- brake blocks not really used for braking. A shade-tree mechanic is one doing informal repair work in less than ideal conditions. When you say "size", which one do you mean: power rating, total mass, or length/width/height? The standard locomotives in my area are the EMC SD70MAC used by the BNSF and the GE AC4400CW used by the Union Pacific. They both have AC motors and produce around 3200 kW of power. The "really big" locomotives were the SD90MAC and the GE AC6000CW, both at around 4500 kW. In both cases, U.S. railroads decided that these giants resulted in having too many eggs in one basket, and they reverted to multiple units of the smaller model engines. 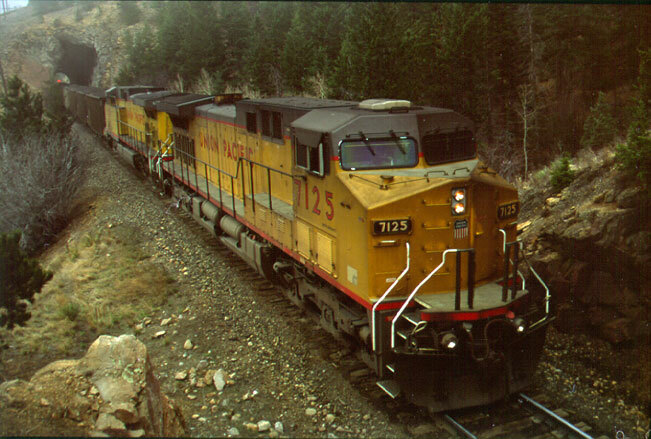 Union Pacific 7125 is an AC4400CW. As far as I know, the US trend to abandon the 6000HP locos was related more strongly to two other factors: (1) frequent breakdowns due to problems with the engines; (2) the issue I mention for Europe, wheel slip in non-ideal weather conditions. ... less frequently maintained track also provide an incentive to put the power out over more axles? In general, Re the reason you mention for the US: in Europe, until recently, the principle was one locomotive per train. The only exception from that being mountain passes, where railways employed pusher locomotives (without coupling them); or, on the main Alpine passes, two pulling locomotives (on the Gottthard, usually an SBB Re 6/6 II and an SBB Re 4/4 II or III for a total of ten axles, called by railwaymen "a Re 10/10"). But none of these, nor the current practice of double (on normal lines) or up to quadruple heading (on Alpine passes) assumed redundance for locomotives breaking down. Here, breakdowns were supposed to be prevented by good maintainance -- then again, trains run shorter distances, and when there is a breakdown, a replacement loco is not far (well, that is, unless bad management reduced spare locos kept in sheds justfor this purpose). Except for the English contingent. They mechanic in the noonday sun. "Frothing Hounds" is a good name for a Weiss bier! Fascinating, DoDo. Danke. And there are some very interesting parallels to the growth of the "conventional" wind industry through the introduction of "squirrel cage" induction generators and accompanying power control innovation. I hoped you would mention those! It's the same technology used in reverse. As far as I know, the US system has only a small area in the NE USA with overhead power available and relies mostly on diesel/electric. GE claims to be developing a hybrid that can run on regenerative breaking - no overhead lines to offer easy storage. NJ Transit ordered 27 ALP-46A, called an "upgraded" version, though in reality from Bombardier's current TRAXX platform, only with the outward appearance of the ALP-46. Regarding hybrids, while GE tries hard, others already have the technology, and Bombardier won two orders for a hybrid version of the ALP-46A: 26 from NJ Transit and 20 from Montreal's AMT. doing a little reading on this, one thing I had not known is that the power companies complained about the first generation thyristor regulators on TVs because they induced DC in the grid. In the context of the diary, I mis-interpreted this to mean a hybrid running both on overhead line (as electric) and diesel (as diesel-electric), despite the last sentence. But just this past week, I read of the GE hybrid in a print issue of the IRJ. So I see now that it's a "hybrid" for being diesel-and-battery-run. GE engineers are designing a hybrid diesel-electric locomotive that will capture the energy dissipated during braking and store it in a series of sophisticated batteries. That stored energy can be used by the crew on demand - reducing fuel consumption by as much as 15 percent and emissions by as much as 50 percent compared to most of the freight locomotives in use today. In addition to environmental advantages, a hybrid will operate more efficiently in higher altitudes and up steep inclines. I also read that at least one European rival, diesel engine maker MTU, wants to develop something similar. Whether flywheels or batteries, past attempts I'm aware of failed on maintenance issues; I hope this time it will work in practice (more so than KERS in Formula One). Since we tend to assume that everything in East Germany was technologically backward, how did the "White Lady" compare to locomotives in western Europe? My letter to Bob Lutz proposing that GM make Trabants was, sadly, ignored. I forgot to add a comment about even older technologies. Though the diary may make it appear so, neither asynchronous AC motors, nor sprung motors/elastic drives are new -- in fact, both appeared in the early days of electric traction. Asynchronous AC motors need tri-phase electricity. Meaning: separate windings in the motor get currents with the same frequency, but shifted by 1/3 periods in time. In the modern locos, these currents are created with the inverters. However, there is a 'simpler' way: feed multiple currents to the locomotive via multiple overhead lines! (And use gears or switch groups for speed regulation.) The most extensive such system was operated in Northern Italy, from the end of the 19th century until 1976. 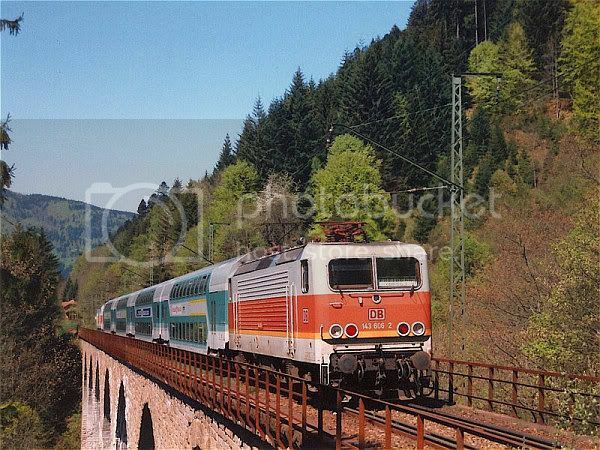 On the photo below from RailFanEurope.net, FS E.554 024 displays her double pantograph near Acqui Terme. When heavy electric locomotives first appeared, motors were rather bulky, and switching was done in fewer steps. So, some form of elastic suspension was a need at even lower speeds - leading to various solutions. An early one used across Europe came from Switzerland, the Buchli drive: in that, the big cogwheel was attached to the wheel with swinging elements (f.e. SBB Ae 4/7). The first hollow shaft drives (then with metal coil springs rather than rubber) also appeared: the quill drive in the USA (PRR GG1, Milwaukee Road class EP-3), the Federtopf-Antrieb in Germany (f.e. DRG Class E 18). A modern electric locomotive optimum speed range is determined by the switching speed of their inverters, and while it is broad, it isn't quite as broad as you suggest. 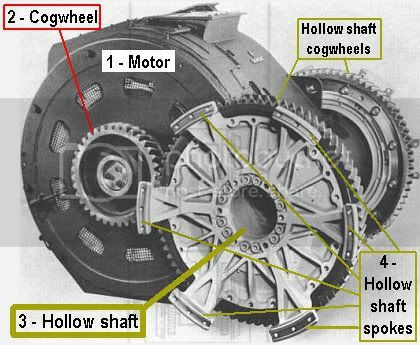 For the high-speed run by the Siemens Taurus they had to change the gear ratio between the traction motor and the final drive (Quill). A key component to making 3-phase asynchronous motors work in locomotive service is the ability to not just vary the frequency of the supplied power, but also the voltage. This is why the power inverters used in locomotives are called "4-Quadrant Variable Voltage Variable Frequency Inverters". As the switching speed of the inverters increases (to raise the frequency), the inverters ability to regulate the voltage decreases. The voltage is determined by the voltage of the input DC, but also by how long the GTO Thyristor, or IGBT is switched on. While the TGV V150 world speed record train got a changed gear ratio and increased wheels, the same was not true of the Siemens loco. They really pushed it to the limit with only minor changes (pantograph replaced for high-speed one, snowplow, windscreen wipers and antennae removed, safety systems disabled, sensors added). With a different gear ratio, much more would have been possible: 6.4MW on 2x4 wheels (counting the measuring car), that's better motorisation than many a high-speed train, even if air resistance is higher. On the second, some sources: Siemens press material, a bit more technical in English is the railcolor.net article on the record run loco; a more detailed description in German, which includes the speed profile, is here. Universal Electric locomotives were great for the passenger operators, but not so good for the freight side of the business since the passenger part always borrowed the freight locomotive and the freight had to wait. I submit that the above situation would arise if (1) locomotives are dispatched for freight and passenger services separately, (2) there is a locomotive shortage, and (3) the passenger service has priority. However, I'm thinking hard where this could happen in practice. Not with the DB class 120, which alternated between IC/EC and freight in a day/night rythm before DB separated services. not the ÖBB Tauri, which proved to have been ordered in too high a number and thus reserves are available. The SBB Re460 probably not either, seeing that SBB had locos better suited for the Transalpine traffic. Smaller batches left - maybe Sr2 Finland? The problems come this way, most freight locomotives are just as busy during the day as at night, and when they do have a period when they are idle it frequently is at a location at some distance from where you might run a passenger train. You could stable a rake of passenger coaches at Maschen Yd. or Rostock-Seehafen but why would you? The alternative is to have light engine movements which clutter up the network and use up driver time, and electricity. Most passenger prefer an arrangement like the Swiss operate with a Clockface timetable. With an arrangement like this the availability of passenger assigned locomotives for freight is very small and limited to the very late night, early morning. But their domestic freight network is predicated on late afternoon freight pickups followed by a sort and then a line-haul period followed by a distribution sort, and then delivery, much like a parcel service. Hm. There are multiple issues here. In most of Europe (unlike Maschen or Vaires), freight yard to passenger station distances aren't that great, especially where the two are adjacent -- in fact, they are comparable to servicing runs. There is, in fact, an enhanced problem of light engine movements in the new separated operations regime: maintenance yards have been separated, too, and centralised and specialised for specific types, thus runs to the maintenance yard can now be much longer (especially in Germany). If a company had one loco type only, the nearest electric locotive maintenance yard would always be suited. In local passenger clockface service, locomotives and coaches are de-facto permanently coupled -- except in rush-hour increased frequency service (say one-hour rythm increased to half-hour rythm), the locomotives of these can be used in another way just when there is more 'space' in the schedule. In long-distance service, locos may take trains on 6-14 hour rides, with the reverse train hours apart, or trains on looped routes (think Hamburg-Stuttgart-Munich-Hamburg or Vienna-Klagenfurt-Salzburg-Vienna). Thus, large gaps (typically in the night) could arise when locomotives are better utilised by switching to another service (be it freight or an express in another direction). For long-distance passenger services, before the proliferation of driving trailers, intermediate stops at terminal stations also meant locomotive change. Locomotive schedules involving freight/passenger interoperation in situations as in 3)-5) were common before proper universal locomotives, already (with locos suited for light freight/local passenger or mountain line express/freight pairings). I emphasize separately, for the case of freight/express passenger mixed operation, that multiple-day locomotive schedules are the norm (e.g. say the maintenance shop has 8 locos, sets up a 7-day schedule, thus 7 locos are active on any given day, with one in reserve resp. maintenance). That may include long runs or multiple runs in whole days in both kinds of services. Re: #1 To a degree this is true, however this is changing as heavy industry is being pushed further from the city center, or the working port is moving further from the historical port near the city center (reference Hamburg, Rotterdam, Bremerhaven, Terneuzen). Another changing dynamic is the rise of the modern Intermodal Terminal replacing early cramped facilities close to city centers (München Riem, Köln Eifeltor, Busto Arsizio, Wüstermark). Basel badly needs to replace Basel Wolf. Re#2 There is no reason for number this to be a big problem, if the MTBF isn't increasing noticeably, it is time to look for a new locomotive builder. The passenger locomotives are being stressed by the high speeds and high daily mileage. Freight locomotives are not stressed like passenger locomotives they cover less mileage (kilometreage?) than passenger locomotive in a given time period, there is no reason to see a maintenance facility more than once weekly. Also passenger locomotives become obsolete more quickly while the nature of freight transport changes more slowly. Energy efficiency is the main reason to replace some of the existing freight locomotive fleet, along with repair costs. Re#8 There is a strong correlation between Market Share and reliability of the service provided. 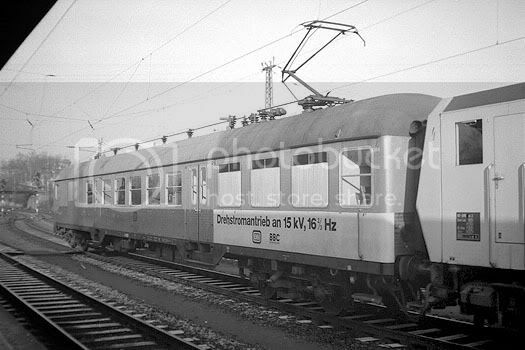 Re: point #9 The Einheitsloks were only interchangeable to a small degree, the Class 110 were 150kph w/dynamic braking, the Class 113 were 160kph (needed for Rheingold and other trains), the 139 and 140 were 110 kph, so while they could do both passenger and freight they have widely differing capabilities. I am sure you have noted the Class 189s working some passenger services for DB Nachtzug, as a current example if you accept the limitations of the freight locomotive. Re 2, I did not speak of a change in frequency of maintenance yard visits. But the average distances travelled when doing so. They are stressed differently. Just for the slip problems discussed elsewhere, they need sand re-supply, and wheel re-profiling if there are blocked wheels. Add to that the consequences of using axle-hung motors (f.e. the bogie frame damage, hit even the TRAXX 2). Do they? Express locos over the past century yes, due to the continually increasing maximum speeds; but old locos (ÖBB 1042, MÁV MÁV V43.10, DB 110, 111, SNCF 8500), some with with retrofitting (ÖBB, ÖBB 1142 and 1144, MÁV V43.20 and .30) survive just fine in local service. Re#2 Freight locomotives are rarely worked at capacity, for US freight diesels the average is about 12% of the time in full throttle, I would expect it is similar for European freight locomotives. I would also expect much lower sand use compared to US operations. I would expect more sand use in shunting service with tighter curves and poorer track alignment. The newest generation of US locomotives use cell technology to report problems back to repair centers, I know Bombardier offers a similar system, and I would expect Alstom and Siemens do too. The Austrian 1042/1142 locomotives served a long life, but the future for the 1044/1144 series has gotten a lot more uncertain, and the 1014/1114 series are about finished. The rapidly expanding demand for both passenger and freight service meant that it was hard to acquire locomotives fast enough, but it is no longer uncommon to see a Taurus lok on a stopping service now. The DB class 110 only have survived as long as they have because of the inadequacy of the former DR Class 143 loks with their 120kph top speed. In spite of the vast numbers of this model I would be surprised to see many survive to 2020, except for the few being converted to Class 114. 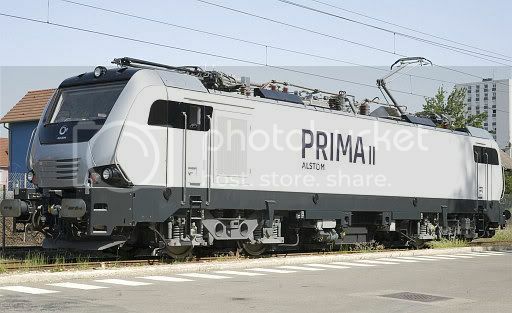 If the TRAXX2 are suffering bogie damage from their Tatzlager traction motors then they must have been designed by the same person who designed the axles for the DB Class 403, 411, 415, and 481 units. Re 8, I see I haven't completed the sentence: For fairness I add one counter-point myself: freight trains are quite often late, thus a switch back to passenger service may need a longer time gap. However, for example for those locos needed in passenger service for rush-hour extra trains, the benefit remains even so. Re 9: in this point, I focused on benefits other than operational. The Einheitsloks (both the steamers of the thirties and the electrics of the fifties-sixties) had a geat many interchangeable parts. In the locomotive shop, even main parts could be cycled between locomotives of different classes in revision at the same time. There have even been conversions between the 110 (originally express), 139 (mountain freight) and 140 (freight) classes. Re#8 This point is no longer significant as the freight customers have to a large extent voted with their money and moved to trucks, the railroads that want their business will have to move the freight when the customer wants it moved. There are many freight trains moving during the peak commuter hours, just not in the zones where the commuter trains are moving. This is why the dedicated freight corridors are being proposed to prevent the interference between passenger and freight traffic. BTW have you noticed that even the staunch advocates of the Universal locomotives, the Austrians, have begun to break up the OeBB Traktion fleet, with some of the 1116s being equipped to operate in Hungary on non-ETCS lines. Re#9 the Br 110s were converted to BR 139s by taking bogies from retired Br 140s, which probably required modifications to the traction motor cooling ducts as the Br 140 uses a bogie with a longer wheelbase. The death knell of the Universal locomotive was sounded by the increasing differences in the type of services they are needed for. Passenger locomotives are required to achieve higher speeds, supply electrical power to passenger cars, and operate in push-pull mode. While freight locomotives need signalling systems for multiple countries, and likely the ability to operate under at least two power systems. Trying two combine both in one locomotive will result in an unaffordable price. Re 1, there are those trends, but, even the new terminals that aren't built on the place of ripped-up tracks groups in old shunting yards don't tend to be that far from city centres, and maintenance yards are moving out, too (see ICE or Eurostar maintenance facilities). Also, there were some breakers on the green-field trend, for example the bad start of most East German GVZ, in particular Großbeeren (no traffic in its first year!) and Erfurt-Vieselbach (though both are now running fine). I was going to add that Locomotive hauled passenger consists are disappearing rapidly anyway. It is quite likely that the SBB have bought their last passenger locomotive, and will only buy EMUs from now on, and the Re460s are used as part of a Virtual EMU in most cases. I thought the Germans were going in the same direction, but I have since heard that they are having second thoughts. It seems that most of the Länder are now favoring EMUs for Regional services like the new Class 440 Coradia Continental, for Bayern. The main use of locomotives in local passenger service today is pulling double-deck cars. In this, Germany and Switzerland are opposite poles: all local service double-deck is EMU in Switzerland, and all local service double-deck is loco-pulled in Germany. France is mixed -- see the new Transilien Primas. Germany is really mixed also for local service, it depends on the Länder and also what line. The Class 425/426 EMUs are used on RB and RE services. But they are not double-deck - I only spoke of double-deck here. (The bulk of S-Bahn traffic is indeed done by single-deck class 420, 422, 423, 424, 425, 426, 470-474, 475-485 EMUs, and some others are in regional service only.) 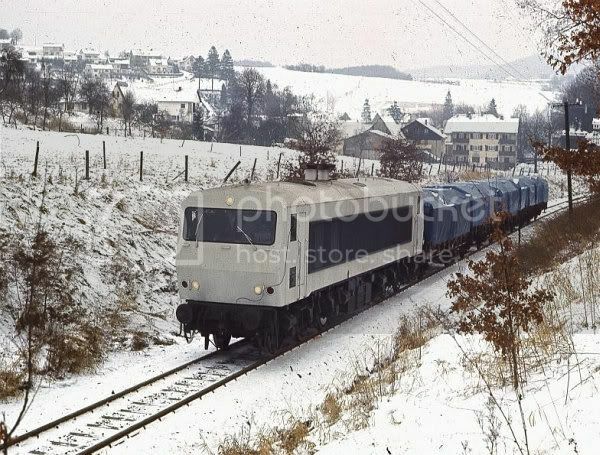 There was one double-deck EMU in Germany, the class 445 prototype, but DB did not purchase it. I could never find out the reason; it should not have been a technical failure, given that the SBB RABe 514 was based on it; so, it was probably price.